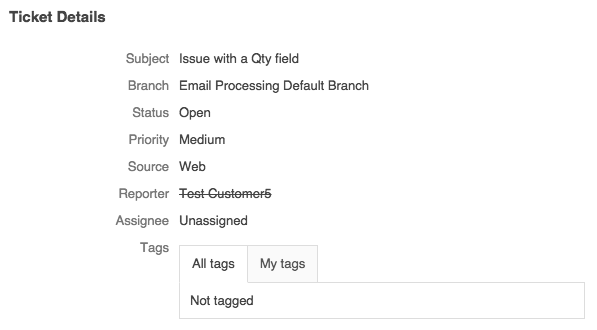 Every customer who creates a ticket at the DiamanteDesk portal or sends an email to the support address is automatically added to the help desk customer database. 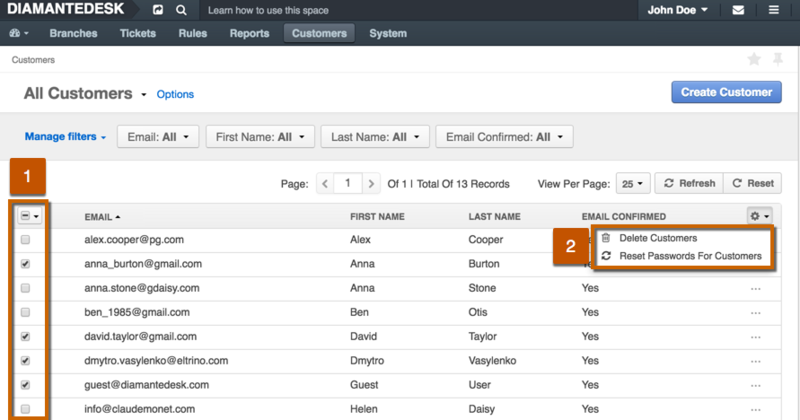 This helps keeping track of all the tickets created by a specific user and monitor general customer activity. To see the list of existing DiamanteDesk customers, open the Customers top menu. Navigate to the Customers top menu. The Customers screen opens. Click Create User at the top right corner of the screen. Create Customer screen opens. Provide the same information that would be required to register at the portal or that would have been automatically populated from the email during the email processing: user Email, First Name and Last Name. After all the necessary information has been provided, click Save or Save and Close to add new user to the system. 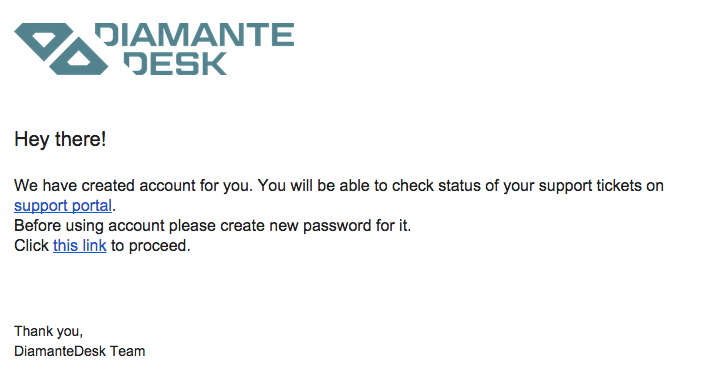 The customer (user) account screen contains general information about the customer, such as name, email and his activity in DiamanteDesk. Email, First Name, Last name These fields display general information about the account owner. This information is obtained either from an email during email processing, from the provided credentials when the user registers in a portal or if admin user creates customer account in a system. Is Active When this field is marked as active, he can successfully log into DiamanteDesk and may create new tickets or resolve any existing ones. If the user is inactive, he should confirm or change his password to be able to log into the system. The User Activity section of the customer account screen displays the general information about all the tickets created by the user in a system. Choose the profiles to which mass actions should be applied. Delete Selected Users. Use this action to delete several customer profiles at a time. Keep in mind that in DiamanteDesk, if the customer profile is deleted, the user information is not entirely removed from the system. It is usually marked as deleted and the profile of a deleted customer is removed from the list of existing customers, although the system displays strikethrough customer first and last name at the tickets where he was assigned as a reporter or if he authored any comments as shown on the example below. Force Reset Passwords For Selected Users. This option allows administrators to force certain/all users to change their passwords due to security measures or any other specific reasons. All the selected users receive emails notifying them that they should reset their passwords, providing a link to the page where the password can be changed.